This is a very well researched, comprehensive and to the point book on the labour laws. It has been outlined keeping in mind especially the requirements of the professionals in practice and challenges faced by the Human Resources professionals in their day to day working. 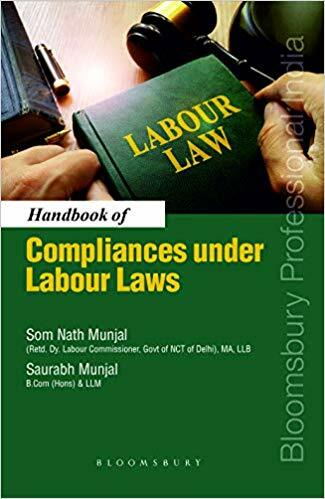 Not only does this book provide a broad understanding of the concepts of labour laws but also aims to provide clarity about the fundamentals of the labour laws in a concise and accurate manner. All the important provisions and compliances have been minutely examined and all the intricacies have been thoroughly explained for the purpose of simplifying the same for day to day usage by the professionals. The simple and lucid language makes it easy to understand and quickly go through the various aspects of the law. Unlike other books, this book doesn't contain the language copied from the acts. The book paints a meticulously integrated and holistic picture of the labour laws. As such, the book stands true to its name and serves the purpose of 'A Practical Guide To Labour Laws'. Key features: Simple and lucid language. Meticulously updated judgements. Elaborate description of important provisions under 'Points to Ponder'. Doubt clearance under 'Frequently Asked Questions'. Usage of table and charts for better understanding. Comprehensive coverage of issues related to labour law compliances. Covers common concerns in the Industry. Compliance Checklist with relevant provisions. A practical guide to labour laws for practicing professionals and human resource professionals.